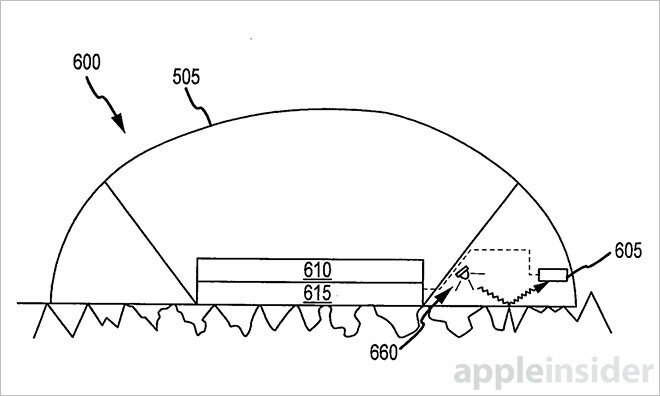 The U.S. Patent and Trademark Office on Tuesday granted Apple an invention covering a mouse peripheral with built-in chromatic sensor, a device designed to deal with tracking issues inherent in conventional designs while acting as a handheld scanner. As detailed in Apple's U.S. Patent No. 8,890,815 for "Incorporating chromatic sensors in computer mice," the company proposes what is basically a scanner shoehorned into a mouse. Over the past decade, the computer mouse has evolved from further away from traditional physical trackball-based designs to optical sensors and more recently laser tracking. 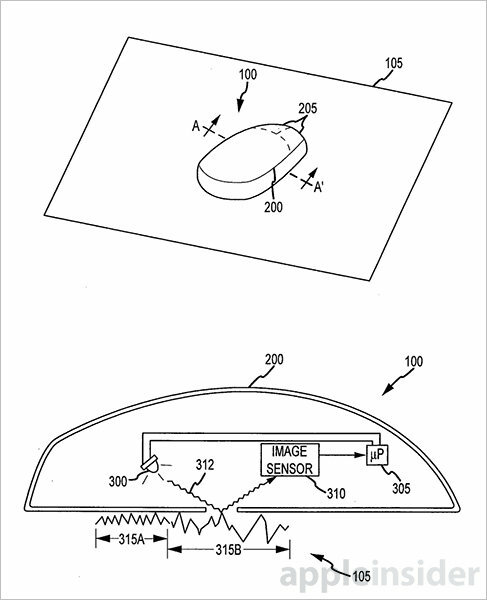 Apple's own Magic Mouse employs a laser tracking engine to distinguish minute surface irregularities, thereby facilitating use without a mousepad. By incorporating a chromatic sensor or sensors (such as CMOS or similar) into the ubiquitous peripheral, Apple proposes an alternative, if not superior, optical solution. As an input device, the mouse is capable of operating in a variety of environments by dynamically adjusting its own onboard processing based on readings generated by the chromatic sensor. Apple's invention uses LEDs, vertical cavity surface emitting lasers (VCSELs) or other similar light sources that can be tuned to output specific wavelengths of light, which can boost sensor response to various surface colors. During operation, light from the mouse's light source reflects off an operating surface and is collected by the chromatic sensor. Evaluating sensor response by region, the mouse can adjust light output in specific areas to compensate for color, or be tuned to adjust for a glass overlay's thickness. In one embodiment, the device can select from and modify a number of different operating characteristics depending on a given surface to more competently track movement. For example, a plain white desk with no color deviation may require a higher sampling rate, while a textured mousepad that allows for less granular processing can trigger a draw down light output to conserve power. Similar image processing techniques are used for scanning, which the invention describes as "strip scanning," or the stitching together of multiple snapshots taken as the mouse moves over an image's surface. As the document mentions, such capabilities would be useful in cases where the mouse is operated as a standalone device without a connected computer, perhaps as a portable scanner. Finally, Apple includes a display embedded on the back of the mouse housing for viewing of scanned images. The display itself can be an OLED component, color filter array or other suitable technology. In some cases, the mouse can be used to magnify selected areas of an image on its housing before sending the data off to a computer. The invention goes on to detail refresh rates, sensor resolutions and technical component specifications. It is unlikely that Apple will bring the scanning mouse to market as current laser technology is more than sufficient for most use cases. Additionally, OEMs like LG already field identical devices that failed to pique consumer interest. For now, Apple appears to be moving toward an ecosystem of multitouch devices inspired by the success of its iOS device lineup. Apple's scanning mouse patent was first filed for in 2009 and credits Brett Bilbrey and Michael F. Culbert as its inventors.